Ikea hacks are my new favourite thing to look up on Pinterest, YouTube and across people's blogs. The idea of turning something cheap and cheerful into something bespoke and even better, luxury looking is talking my language. 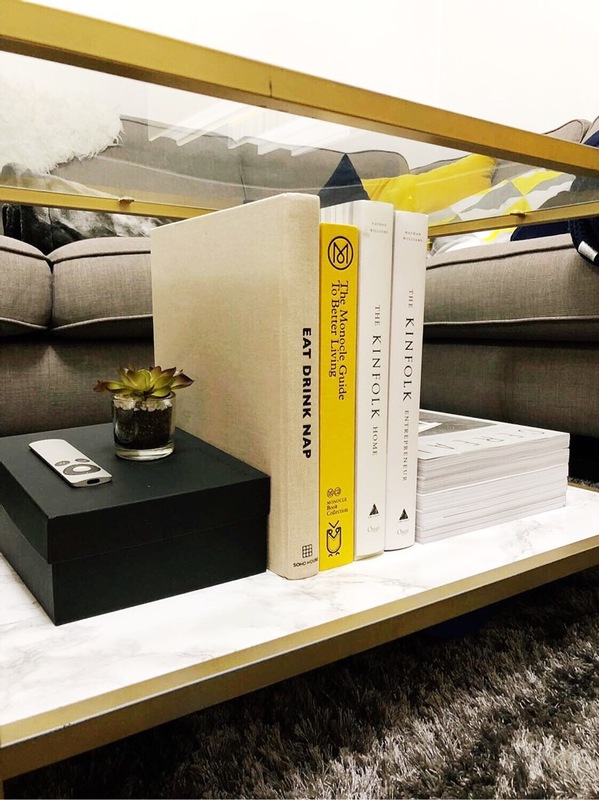 This coffee table hack definitely got my creative juices flowing, as I was totally taken with other brand's luxurious brass framed tables for the living room. Budget held me back I have to admit, but the result of this cheap hack has made me SO happy. It now takes pride of place and everyone, and I mean everyone asks where we got it from. I love seeing the reaction when I say I upcycled it! Just. So. Good. I wanted to share the process with you, just in case you find yourself in a similar situation as it's so easy to do! First, you need to buy the table; it's only £45 for a nest of two! VITTSJÖ Coffee Table from Ikea is ridiculously cheap, considering the high-end 'West Elm' look (dare I say that? )at the tables you get at the end. No tension build required here, just look at it...I am in love, but what do you think? I am SO happy with how this turned out! If you fancy finding out how I went about it, then carry on reading. Assemble the frame of your VITTSJÖ tables but don't add the glass or the MDF base just yet. Put cardboard/covering down outside in a well-ventilated area and place the frame in the centre ready to be sprayed. Cover the frame in the primer. Spraying from each 90-degree angle helped me cover every inch quickly and methodically! Wait until touch dry - the can will advise on how long to wait! Spray again with the primer to ensure all areas have been covered and wait until dry. Spray the first coat of coloured spray paint over the frame. I used Brilliant Gold to match the other metal finishes in my living room, but you can use whatever colour you please. Metals tend to give a more luxury final look, if that's not your thing then maybe a neon or bright colour could give a room a pop of colour! After waiting for this to dry, apply a second coat. In between coat, roll out your marble paper on a clean surface and place the base MDF on top. Cut around the edges leaving a good 15cm clearance to allow the edges to wrap around the board. Carefully trim the paper at the corners so this can be folded in and around. I cut diagonally here, thinking back to a time when I wrapped my school books! Remove one edge of the sticky back and adhere to the board. Slowly remove the rest of the backing paper, applying to the board as you go and smoothing out with the credit card where necessary. Seal all the edges of the board in by folding the flaps of tolerance paper down. Once dry, bring the frame back inside and put the marble board into place, followed by the glass tops et voila! Dreamy tables complete. Next on my list is a storage unit for our hallway...back to the VITTSJÖ page I go!